White House Releases Complete Benghazi Emails : The Two-Way The White House releases all the emails related to the so-called talking points produced in the aftermath of the attack on the U.S. diplomatic post in Benghazi. 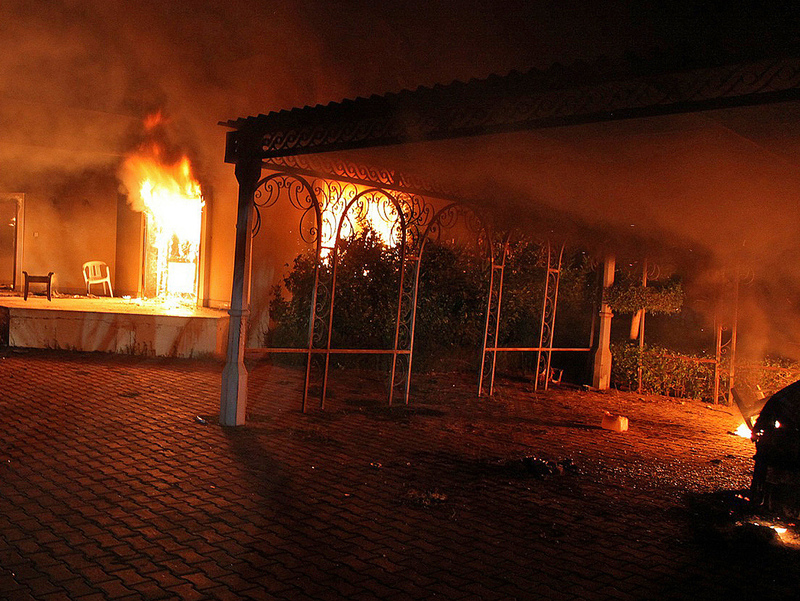 Sept. 11: The U.S. consulate in Benghazi, Libya, was aflame after coming under attack. In a statement, Brendan Buck, a spokesman for House Speaker John Boehner, said the emails "contradict statements made by the White House that it and the State Department only changed one word in the talking points." "The House interim report found that 'senior State Department officials requested the talking points be changed to avoid criticism for ignoring the threat environment in Benghazi' and that those changes were ultimately made. Those findings are confirmed by the emails released today, and they contradict statements made by the White House that it and the State Department only changed one word in the talking points. The seemingly political nature of the State Department's concerns raises questions about the motivations behind these changes and who at the State Department was seeking them. This release is long overdue and there are relevant documents the Administration has still refused to produce. We hope, however, that this limited release of documents is a sign of more cooperation to come." The Obama administration has decided to release the complete set of emails detailing the back-and-forth over how Benghazi would be portrayed to the public. You can see them here. While many of the details from the emails have already been made public, the release of the complete set, as The Wall Street Journal writes, "paints a fuller picture of an administration struggling with how much to disclose about an attack that eight months later remains a focus of partisan division. "Exclusive: Benghazi Talking Points Underwent 12 Revisions, Scrubbed of Terror Reference"
In it, ABC's Jonathan Karl said that "ABC News has obtained 12 different versions of the talking points" and that "White House emails reviewed by ABC News suggest the edits were made with extensive input from the State Department." "In an email dated 9/14/12 at 9:34 p.m. — three days after the attack and two days before Ambassador Rice appeared on the Sunday shows — Deputy National Security Advisor Ben Rhodes wrote an email saying the State Department's concerns needed to be addressed. 'We must make sure that the talking points reflect all agency equities, including those of the State Department, and we don't want to undermine the FBI investigation,' [Karl quoted Rhodes as saying]. We thus will work through the talking points tomorrow morning at the Deputies Committee meeting.' "
Karl added that the next day the State Department's concerns were addressed: "The CIA drafted the final version of the talking points," he reported, "deleting all references to al-Qaida and to the security warnings in Benghazi prior to the attack." The implication was that the White House, thanks in part to the email from Rhodes, had weighed in on the side of the State Department to downplay any al-Qaida connection to the attack that killed the U.S. ambassador and three other Americans. Another key implication: that ABC News had seen the email. "CNN has obtained an e-mail sent by a top aide to President Barack Obama about White House reaction to the deadly attack last September 11 on the U.S. diplomatic compound in Benghazi, Libya, that apparently differs from how sources characterized it to two different media organizations. "The actual e-mail from then-Deputy National Security Adviser for Strategic Communications Ben Rhodes appears to show that whomever leaked it did so in a way that made it appear that the White House was primarily concerned with the State Department's desire to remove references and warnings about specific terrorist groups so as to not bring criticism to the department." Tapper posted the email here. It appears to show Rhodes wrote that: "We need to resolve this in a way that respects all the relevant equities, particularly the investigation." He adds that "a ton of wrong information" was being distributed and that "insofar as we have firmed up assessments that don't compromise intel or the investigation, we need to have the capability to correct the record." There's no mention of the State Department in the email Tapper obtained. The source who told Karl otherwise, "seemingly invented the notion that Rhodes wanted the concerns of the State Department specifically addressed," Tapper reports. The White House, as The Hill writes, is accusing congressional Republicans of being behind the version of events that Karl was given. As for Karl, he's still saying he "obtained" the email. But he also says he was "quoting verbatim a source who reviewed the original documents and shared detailed notes. ... The source was not permitted to make copies of the original e-mails. The White House has refused multiple requests — from journalists, including myself, and from Republican leaders in Congress — to release the full e-mail exchanges." Merriam-Webster's definition of the word obtain: "To gain or get (something) usually by effort." "I asked my original source [Tuesday] to explain the different wording on the Ben Rhodes e-mail, and the fact that the words 'State Department' were not included in the e-mail provided to CNN's Tapper. "This was my source's response, via e-mail: 'WH reply was after a long chain of email about State Dept concerns. So when WH emailer says, take into account all equities, he is talking about the State equities, since that is what the email chain was about.' "